All American Derby(G1) winner Feature Hero will make his West Coast debut on Friday in the Town Policy Handicap. LOS ALAMITOS, CA—OCTOBER 29, 2013—Reliances Ranches LLC’ Feature Hero, the winner of the richest race in the history of Quarter Horse racing earlier this year, will make his Los Alamitos Race Course debut when he headlines the running of the $25,000 Town Policy Handicap on Friday night. The Town Policy is the eighth race on the card and helps kick off a weekend of rich events. The Orange County track will host the running of the Grade 1 $953,200 Los Alamitos Super Derby on Saturday and the $1,044,700 Golden State Million Futurity on Sunday. The gelding sired by Valiant Hero won the Grade 1 $2.8 million All American Derby on September 1 with a strong late charge to give him the win in the sport’s richest race ever. The effort earned him a berth to the $750,000 Champion of Champions and the 400-yard Town Policy will serve as perfect preparation to take on Ochoa, Last To Fire, Rylees Boy and more in the Champion of Champions. Sent off at 24-1 in the All American after posting the 10th fastest qualifying time, Feature Hero defeated fastest qualifier Bon Accord in the All American Derby. He was hand-timed in the 440-yard race in a time of :21.560. Jimmy Dean Brooks piloted Feature Hero in the All American and will do the same in the Town Policy for trainer Eddie Willis. Jimmy Dean Brooks is the son of Ruidoso and Oklahoma Quarter Horse Racing halls of fame jockey Roy Brooks. Jimmy also rides Remington Park Invitational Championship winner Priceless Feature, who has also earned a berth to the Champion of Champions. 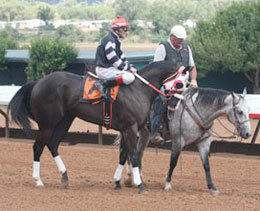 Earlier this year, Feature Hero was runner-up to Brace For Bernal in the $253,000 Remington Park Oklahoma-Bred Derby. He will enter this race with four wins from 14 starts and earnings of $1,306,368. He earned $1,180,110 from that amount in the All american Derby. "We believed in this horse," said co-owner Micah McKinney in an article that appears on aqharacing.com. "We were not concerned that he was the 10th fastest qualifier. This (the All American Derby) is a thrill of a lifetime." Reliance Ranches is a family-owned business based out of Llano, Texas, run by the McKinney family. It includes Gary and his wife Shiela; son Micah and his wife, Leslie; and daughter M’Lissa Schoening and her husband, Jeremy. The family has an oil-gas business, but has always enjoyed horses and the agricultural lifestyle. The McKinneys started racing horses in the mid 2000s and has since campaigned current two-year-old star Coronado Cartel and the talented mare Cruzin The Wagon. Their breeding program is headed by champion mare Spit Curl Diva, a winner of more than $800,000, and stakes winner Illegal Fireworks. A $40,000 purchase from the Ruidoso Select Yearling Sale, Feature Hero was bred by Lana Merrick and Kent Jackson of Cheyenne, Oklahoma. He’ll come in after posting a 220-yard turn and work of :12.70 on October 18. The field will also feature the champion filly PJ Chick In Black, who will start from the outside post seven in the Town Policy. Owned by Dennis Bowen, Susan Taylor and Jack Smith Farms, the John Stinebaugh-trained filly PJ Chick In Black endured a nightmare of a trip in her trial to the Super Derby. The filly broke in and lost her racing path and could never challenge on the way to a seventh place finish. She had looked terrific during an evening workout a few weeks prior to her Super Derby start. A winner of over $650,000, she’ll come in with a record nine wins in 12 career starts. Esgar Ramirez will ride the Desirio filly. Golden State Derby runner-up Jess Being Valiant, local stakes winner Look Whos Running, Golden State Million Futurity runner-up Separate Interest and One Fancy Eagle will complete the field.